South Africa’s third-largest protected area and oldest UNESCO World Heritage Site, the 3,320 square km iSimangaliso follows the Indian Ocean coastline for a full 220 km north of Lake St Lucia (Africa’s largest estuarine system) to Kosi Bay on the border with Mozambique. It is easily the country’s most biodiverse reserve, incorporating five separate Ramsar Wetlands, a lush tropical mosaic of mountains, bushveld, palm groves, wooded dunes, grassland and coastal forests, as well as a 5 km-wide marine section that harbours Africa’s most southerly coral reefs. The faunal diversity of iSimangaliso (Zulu word meaning ‘something wondrous’) was encapsulated by Nelson Mandela, who described it as “the only place on the globe where the oldest land mammal (rhinoceros) and the world’s biggest terrestrial mammal (elephant) share an ecosystem with the world’s oldest fish (coelacanth) and the world’s biggest marine mammal (whale)”. Indeed, iSimangaliso can boast a higher count of vertebrate species than any other African conservation area with 129 terrestrial and aquatic mammals, 525 birds, 128 reptiles, 50 amphibians, and 991 marine as well as 48 freshwater fish. Despite this, while wildlife is abundant in parts, the stunning coastal scenery is at least as big an attraction as the game viewing. Jungle-swathed St Lucia Village, fringing the freshwater estuary for which it is named, stands at the far south of iSimangaliso and is the park’s main travel hub. A contender for South Africa’s most wildlife-friendly settlement, it is home to plentiful hippos and crocs, as well as the likes of porcupine, bushbuck and warthog. The tropical birdlife includes African fish eagle, Trumpeter hornbill, Purple-crested turaco and Mangrove kingfisher. Popular activities include visits to an out-of-town crocodile farm and launch trips on the St Lucia Estuary. Set below forested dunes on a reef-shielded beach north of St Lucia, Cape Vidal is a superb beach that offers good low-tide snorkelling and seasonal land-based whale and dolphin viewing. It also forms a vital seasonal nesting site for loggerhead and leatherback turtles. Halfway between St Lucia and Cape Vidal, the forested dunes around Mission Rocks are some of the world’s tallest and provide sanctuary to the secretive red duiker and localised blue monkey. Buffalo, rhino, elephant and possibly cheetah might be seen on the game-viewing loop to Lake Bhangazi. The 400 km2 uMkhuze Game Reserve offers the finest game viewing within iSimangaliso. Home to elephant, buffalo, giraffe and and elusive populations of leopard and cheetah, it is popular with wildlife photographers thanks to some well-sited photographic hides that attract a steady stream of nyala, kudu, zebra, warthog, white rhino and black rhino. More than 420 bird species include the localised Yellow-spotted nicator, Livingstone’s turaco, Neergaard’s sunbird and African broadbill. 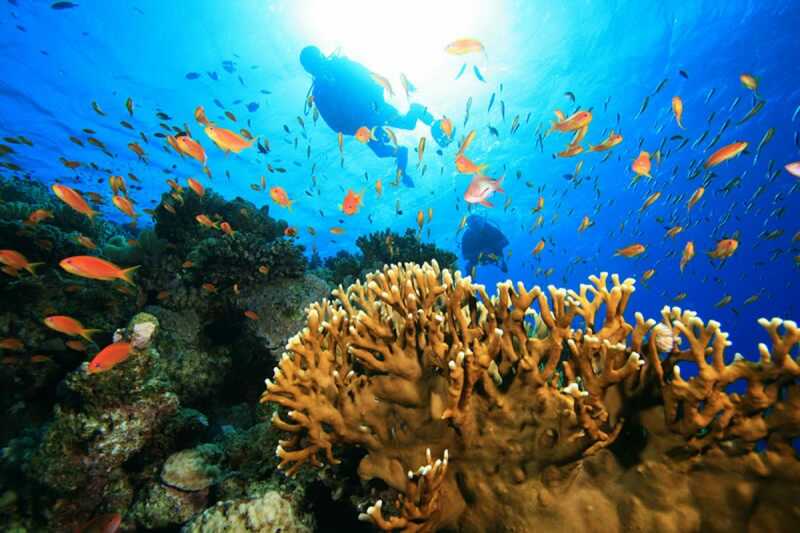 Africa’s southernmost coral reefs stand offshore of Sodwana Bay, whose Seven Mile Reef is ranked among the world’s most beautiful dive sites, with overhangs, drop-offs and mushroom rocks reaching around 20 m below the surface, and a dazzling array of colourful reef fish to be seen. South Africa’s largest natural freshwater body, Lake Sibaya is backed by tall forested dunes and supports around 150 hippos along with a wide diversity of aquatic birds. Comprising eight lakes and a series of connecting channels that drain into the Indian Ocean through a sandy estuary, scenic Kosi Bay offers unusually calm snorkelling conditions and the opportunity to seek out 150 marine fish species on the rocky reef in the estuary mouth. The complex fishing traps set in the estuary by the local Thonga people represent a highly sustainable form of traditional resource management, since the estuarine fish are readily replenished from the open sea. St Lucia village is a convenient base for day safaris to the nearby Hluhluwe-Imfolozi Game Reserve, providing refuge to all the Big Five, including the world’s densest populations of both white and black rhino. Other wildlife includes African wild dog, giraffe, zebra, impala, nyala, greater kudu, warthog, Vervet monkey and almost 400 bird species. Sharing its eastern boundary with iSimangaliso, the private Phinda Resource Reserve is KwaZulu-Natal’s most prestigious safari destination. All-inclusive packages with guided game drives in an open 4x4 are also certain to yield all the Big Five over the course of a two- to three-night stay. A dense population of habituated cheetahs allows for great close-up behavioural viewing. Not strictly speaking a private reserve, but effectively functioning as one, the 300 km2 Tembe Elephant Park is best known for its giant tuskers, but the rest of the Big Five are also present, and the birdlife is fantastic. Several scheduled flights daily connect Johannesburg to Richards bay, a large industrial port town about one hour’s drive southwest of St Lucia Village by road. There are also regular flights from most major South African cities to Durban, about three hours’ drive from St Lucia along the N2. Some visitors to Phinda and other private reserves use direct charter flights. Most Durban-based tour operators offer overnight trips to southern iSimangaliso and/or Hluhluwe-Imfolozi. The region is also well suited to self-drive visits, though 4x4 is required for most places that lie north of Mkhuze Game Reserve and east of the N2. A varied selection of budget to mid-range accommodation can be found in St Lucia Village. Most reserves set within or associated with iSimangaliso have inexpensive but comfortable rest camps. Upmarket bush camps can be found in Phinda, on the outskirts of Hluhluwe-Imfolozi, and at certain sites along the iSimangaliso coastline north of Sodwana.